The Clemmer Theatre, as the Bing Theater was originally called, opened in 1915. That is also the year many film historians consider the beginning of the modern era of the motion picture. Reviewing the theater at its opening, the Spokesman-Review commented 'an atmosphere of richness is over everything.' The theater glowed with 1,600 lights. Murals on the walls were painted by Ivar Petersen, the muralist who had a year earlier painted murals is the Davenport Hotel. The acoustical shell over the stage, though built for function as a concentrator of the organ sounds, gave 'an elaborate architectural effect' and 'is the first of such design to be installed in any theater. 'After its first decade, The Clemmer was scooped up in a campaign by movie studios to own the theaters where their films were shown. Paulsen and Clemmer sold their interests to Carl Leammle's Universal Studios in 1925. The new manager, Roy Boomer, decided to try to generate interest by hiring live acts to perform between movies. 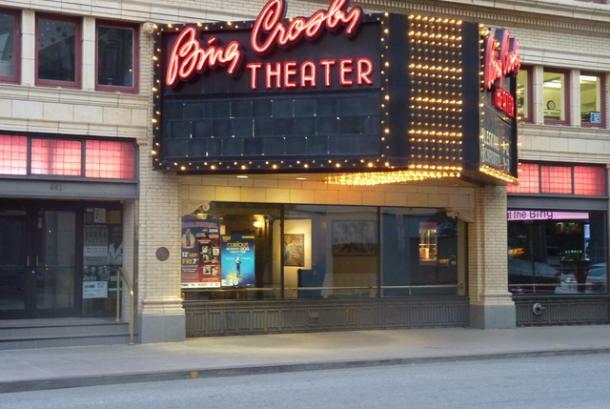 One of the performers he hired was a local jazz drummer and sometime singer by the name of Harry Crosby.In 1929, Universal sold the theater to a new Spokane owner who renamed it the Audian. Two years later the theater changed hands again and became the State Theater. 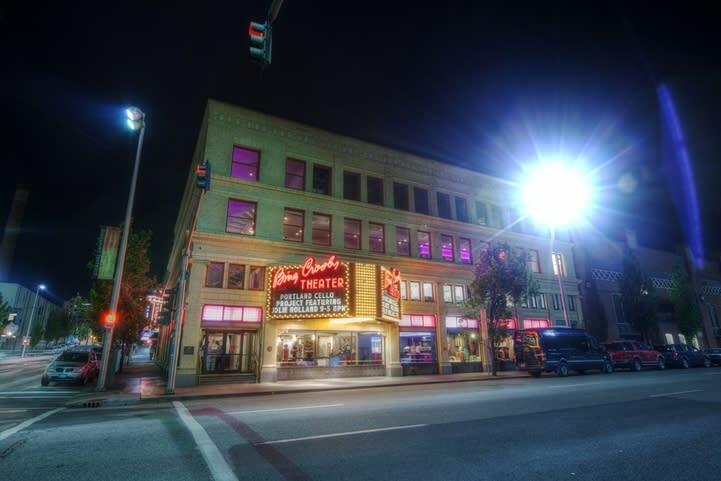 Operating under that name for the next half century, it became a fixture of Spokane's night life until it closed as a movie theater in 1985.The building was purchased by the Metropolitan Mortgage Company and completely renovated before reopening in 1988. Its stage was enlarged and it began a new life as a theater for live shows under the name of Metropolitan Theater of Performing Arts, 'The Met. 'When its sponsor, the Metropolitan Mortgage Company, went out of business in 2004, the theater was purchased by Spokane businessman Mitch Silver and continued its roll as a venue for touring shows and for local organizations that use it as their home stage. In 2006, a citizens group received Silver's permission to rename the theater and raised money to build a new marquee. 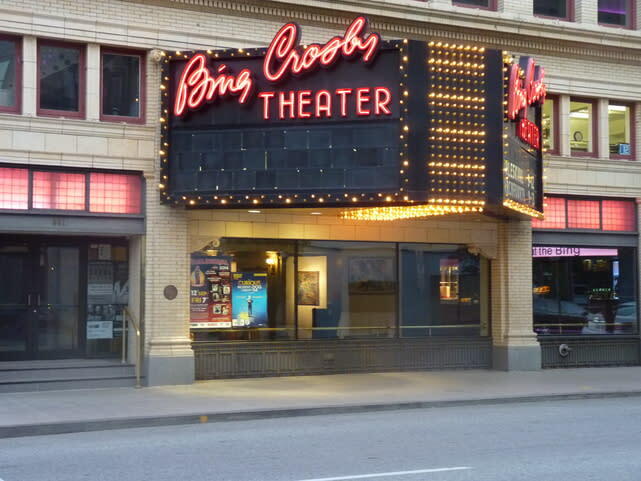 It has been The Bing Crosby Theater ever since. Check our website for more historical info on the Bing Theater. Hours: Varies on event. Check out our website. Description The Bing Crosby Theater is an elegantly restored 1915 neoclassical theater, perfect for live performances and corporate events. Host your entire event or enhance your meeting with a private concert just for your attendees. The Bing’s professional staff is technically equipped with a complete sound and stage lighting system and video/film projection.